Do you have the need for speed? Whip into the fast lane on the all-new Razor Power Rider 360 Electric Tricycle. With top speeds of up to 9 miles per hour, the Razor Power Rider 360 Electric Tricycle is sure to make you the fastest kid on the block! Why walk or ride a bike when you can arrive in style with the Razor Power Rider 360 Electric Tricycle. Get wherever you need to go with style and speed. Tricycles aren’t just for little kids anymore. Jump in the seat of the Razor Power Rider 360 Electric Tricycle and feel the speed. Race your friends, make a track, the possibilities of fun are endless with this awesome electric tricycle. Complete full 360 degree turns. Intense mega drifting capabilities make the Razor Power Rider 360 Electric Tricycle one of a kind. Live life in the fast lane and impress all of your friends and family with your tricks and drifting skills. Everybody start your engines! At the press of a button, with push button technology, you’ll be able to start the chain-driven electric motor. It’s that easy. The Razor Power Rider 360 Electric Tricycle does all the work for you; no pedaling is required. Just jump in, sit back and enjoy the fun and speed that the Razor Power Rider 360 Electric Tricycle has to offer. Not only was this electric tricycle built for speed, it was also built for drifting and making 360 degree turns on a dime. Get up some speed and rely on the heavy-duty rear castors, to achieve 360 degrees of versatility. Try mastering the latest tricks or zip in and out of an obstacle course. 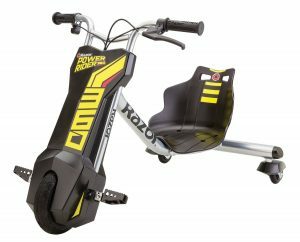 Spin slide and drift into first place every time with the Razor Power Rider 360 Electric Tricycle. The Razor Power Rider 360 Electric Tricycle comes with a 12 Volt rechargeable battery and battery charger. Get an hour of play time on every full charge. Simply plug your battery into the included battery charger. Just wait for the battery to charge and you will be ready for the next race. With this Eco-friendly rechargeable option, the days of purchasing expensive replacement batteries will be a thing of the past. Speed in like a bolt of lightning with the sleek design and the contrasting yellow and black color scheme. The roomy bucket seat provides optimal comfort and elbow room. Get a grip and hold on tight with the comfortable rubber gripped handles. Since no pedaling is required you can put your feet up on the folding foot pegs, sit back and enjoy the ride. The Razor Power Rider 360 Electric Tricycle is made out of only the best high-quality materials. Reinforced with a specially designed welded frame, made of high-performance steel, makes it very durable. The front wheel was made to withstand high impacts and top speeds. Going fast may not sound safe, but the Razor Power Rider 360 Electric Tricycle was designed with safety in mind. Avoiding over directing or collisions is possible. Just use the front braking system located on the handlebars. Safety is right at your fingertips and you’ll be in control. The Razor Power Rider 360 Electric Tricycle is number one when it comes to speed. Be the best, be the fastest on the Razor Power Rider 360 Electric Tricycle. Impress your friends with your drifting and tricks. Fly through your homemade race track. Great for kids of all ages. 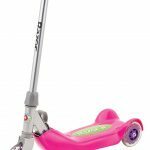 Made to feel roomy and with a weight capacity of up to 120 pounds, makes it fun for big kids too! This durable electric tricycle will last and you’ll get plenty of years of use! 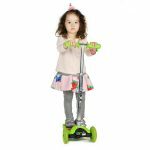 Other than having to wait for it to charge the Razor Power Rider 360 Electric Tricycle has so many great features that make it ideal fun for everyone! Whether you’re racing your friends or family, doing stunts and tricks, or enjoying the speed you’ll be cruising in style on the Razor Power Rider 360 Electric Tricycle. Great fun for the whole family. © ForScooter.com. All rights reserved.The forscooter.com is a participant in the Amazon Services LLC Associates Program, an affiliate advertising program designed to provide a means for sites to earn advertising fees by advertising and linking to Amazon.com.